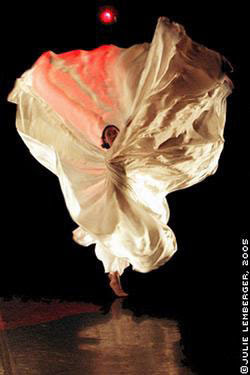 On Tuesday, April 3, 2007 the Westminster Arts Center at Bloomfield College will host the performance “Dance of the Elements,” a powerful celebration featuring dance pieces by Jody Sperling (Time Lapse Dance) which bring The Art of Loie Fuller to life. The performance will begin at 7:30 pm in the Van Fossan Theatre located on the corner of Franklin and Fremont Streets in Bloomfield, and will also include a lecture-demonstration. for more about fuller, see our earlier post; also check out kora in hell about fuller and other dancers of that era. So nice to see it again!! i think you are overcome the freezing trouble already. i love these pictures very much, thanks for sharing!! 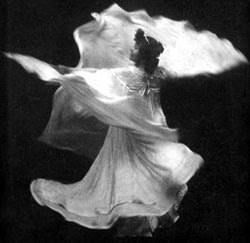 OOH, this is gorgeous and I am going to look up more information about Loie Fuller on the web. I hope she comes to the Bay Area at some point. That dress she is wearing is poetry in motion. This entry is sheer, transparent delight. harlequin and princess--what a lovely mental image that combination makes! yes! oh let's go together, princess. i was surprised to like it but i think she really did catch the spirit. Hi, I'm back and found the Judy Sperling website which I will peruse later. I am spending more time enjoying other people's work. Does she have an upcoming performance? I enjoyed this so much it inspired me to do my own little post on this. Found a uTube video of her dancing. Great to see you acknowledging Loie Fuller. I think what makes this picture spectacular is the dress captured at the right moment and more importantly the beautiful costume. a truth based on myth which continues to dance!